Raised in the Shawnigan area of Vancouver Island, at Chemainus, by her very English parents Mr. and Mrs. Richmond Beauchamp Halhed, Beryl Mildred Cryer was born Beryl Mildred Halhed in Auckland, New Zealand in 1889. Having arrived at Shawnigan Lake in 1892, she later maintained the area received its name from a hybrid word commemorating two early Anglo settlers, Shaw and Finnegan. She married local businessman William Claude Cryer and they had one child. 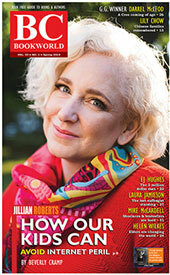 During the Depression, at the request of the managing editor of the Daily Colonist newspaper in Victoria, she collected Coast Salish stories from Hul'q'umi'num elders, mainly her next door neighbour Mary Rice from Kuper Island, as well as Joe and Jennie Wyse, for a series of 60 articles that appeared in the Sunday Magazine supplement. In the 1930s she also co-wrote an article with Jennie Wyse (Tstass-Aya) for the Daily Colonist about a battle between the Snunéymuxw of Gabriola Island and the Lekwiltok from a century before. In addition, she recorded memories of the Douglas Treaty from Joe Wyse [Quen-Es-Then), as interpreted by his wife Jennie Wyse, and published his account in the Victoria Colonist. Although she was not trained as a journalist or anthropologist, Cryer was careful to keep track of the sources of the narratives, enabling ethnographers who came afterwards to trace their origins and better understand their meanings. Her associations with the Coast Salish led to the publication of her book slanted towards children called The Flying Canoe: Legends of the Cowichans (Victoria: J. Parker Buckle Printing, 1949). She died in Welland, Ontario, in 1980. Cryer's contributions to coastal ethnology were subsequently edited by Chris Arnett for Two Houses Half-Buried in Sand: Oral Traditions of the Hul'qumi'num' Coast Salish of Kuper Island and Vancouver Island (Talonbooks 2007). Cryer, B.M. 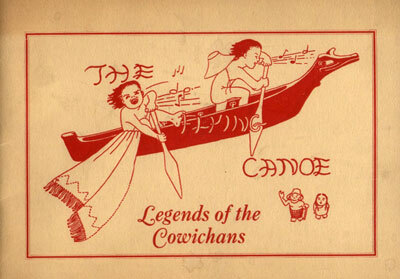 The Flying Canoe: Legends of the Cowichans (Victoria: J. Parker Buckle Printing, 1949). [BCBW 2007] "Kidlit" "First Nations" "1900-1950"
A vital collection of writings about First Nations people and culture as it existed on the island coasts of the Depression-era Pacific Northwest and originally published in the pages of Victoria's oldest newspaper, The Daily Colonist, the 70 stories included here are the result of a unique collaboration between a middle-aged woman, Beryl Cryer, of upper-class British ancestry, and well-known Hul'q'umi'num'-speaking cultural elders, keenly aware of the punitive anti-land claims legislation passed by the Canadian Parliament in 1927, and therefore eager to have their stories told and published.